Gerald of Wales records the visit in 1188 of Archbishop Baldwin of Canterbury to what he calls ‘Cruker’ Castle, during the recruiting trip around Wales for the crusade. The party spent two nights at Crug Eryr after their visit to Radnor Castle, where they had been joined by Rhys ap Gruffudd, Prince of Deheubarth (‘The Lord Rhys’) and his son in law Einion o’r Porth Prince of Elfael, son of Einion Clud, who had married Rhys’s daughter Susanna. At twilight on Saturday 5th March Maelgwn ap Cadwallon, Prince of Maelienydd and son of Cadwallon brother of Einion Clud arrived at Crug Eryr. Gerald records that the Archbishop spoke with the Prince and he is said to have been signed by the Cross, as his cousin Einion o’r Porth and The Lord Rhys had done before him. The party then headed to Hay on Wye on Monday 7th March. 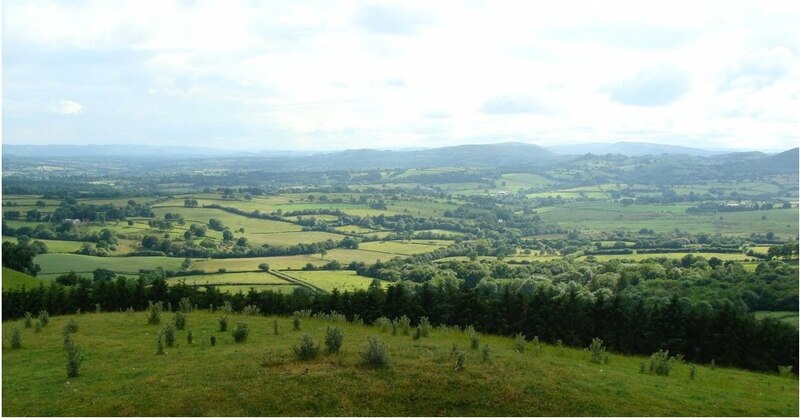 Below: a view south west from Crug Eryr, illustrating its commanding position. Cefnllys is probably the most impressively located and dramatic site of any of the castles of Maelienydd. It could quite easily have been the key fortified site of the dynasty of Rhwng Gwy a Hafren, perhaps the centre of power of Elystan Glodrydd and his son Cadwgan. There is an argument that its name has been mixed up with that now applied to the smaller castle nearby, and also on the River Ithon (in Welsh: Afon Ieithon), known as Dinieithon. The clue to the reason why this may be so is found in the meaning of the name Dinieithon - like Dinboeth, the first part ‘Din’ comes from the old Welsh/Brittonic word Dinas, which means ‘Citadel’ and the second part means literally of the Ithon, since it is almost completely surrounded by the River Ithon. ‘Citadel’ does not at all describe the motte and bailey site marked on maps as Dinieithon today. The site of Cefnllys is on a dramatic piece of high ground, of a sort much loved by the Welsh - very much more a ‘Citadel’ and is probably the site of a much older fortification, that the Norman Mortimers re-used. 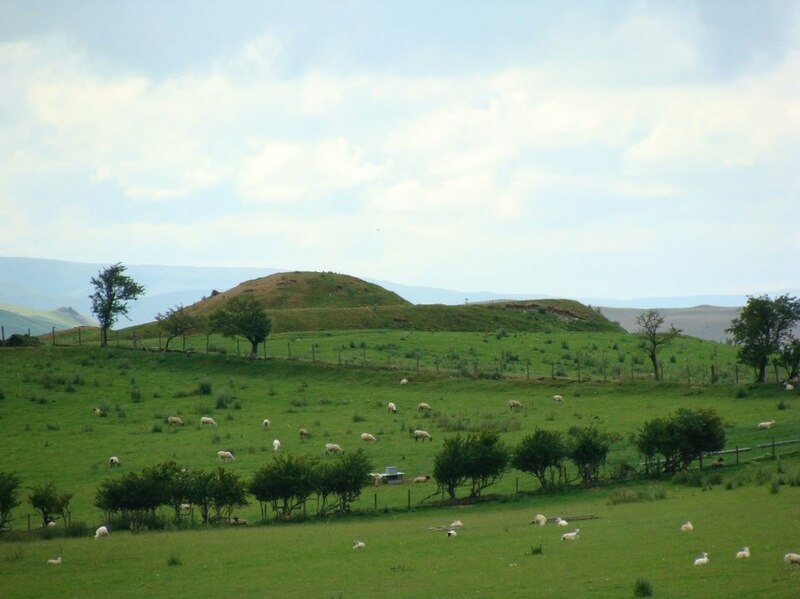 The use of the word Llys (which means Court in English) in the name Cefnllys, indicates that it was the site of the court of the local ruler, and therefore an important place of governance. 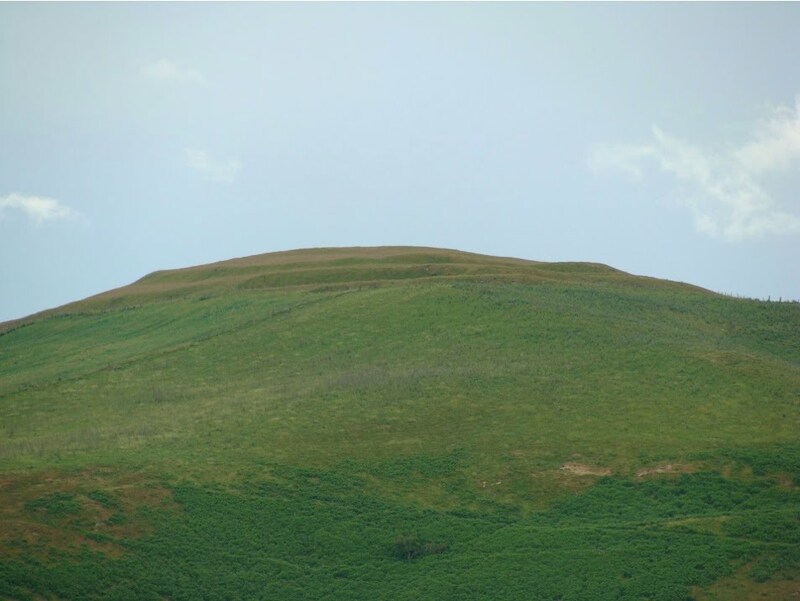 There was more than one castle built on top of Cefnllys and the remnants of each can be clearly seen, as can the site of the hall of Ieuan ap Philip (‘Ieuan Goch’), a direct descendant of Hoedlyw ap Cadwgan ab Elystan Glodrydd through Madog Fychan, a brother of Philip Dorddu and son of Hywel ap Madog of Croesgynon. Hywel’s great grandmother was Elen, a daughter of Einion Clud, Prince of Elfael and wife of Gruffudd ap Gronwy ap Gwergeneu ap Hoedlyw ap Cadwgan ab Elystan. Ieuan was Constable of Cefnllys in the 15th century. The famous bard Lewis Glyn Cothi wrote many poems about Ieuan and his hall at Cefnllys, which the poet describes as having been rebuilt by Ieuan, who was clearly delighted to be in possession of an ancient citadel in his family’s former kingdom. Cefnllys was then part of the royal estates and it was Richard Plantagenet, Duke of York who instructed Ieuan ap Philip to rebuild Cefnllys. along its banks in the middle of the photograph, immediately in front of the place from which it was taken. of the citadel and later castles, protected on many sides by the river and on top of a steep sided rocky hill. The name of this place has been recorded with many different spellings. The original name was Dinboeth - meaning The Burning Citadel, from the old Welsh (& Brittonic) words Dinas, which in this geography means ‘citadel’ and the word Boeth, which means ‘burning’. One explanation for this name is that it refers to the hill having been burned to clear it before the original site was built on. The use of the word Dinas suggests that the site is a very old one and probably an important historical location. Below the summit to the south are old earth works. The Norman Mortimers had therefore built on an important pre-existing Welsh fortification with an ancient origin. 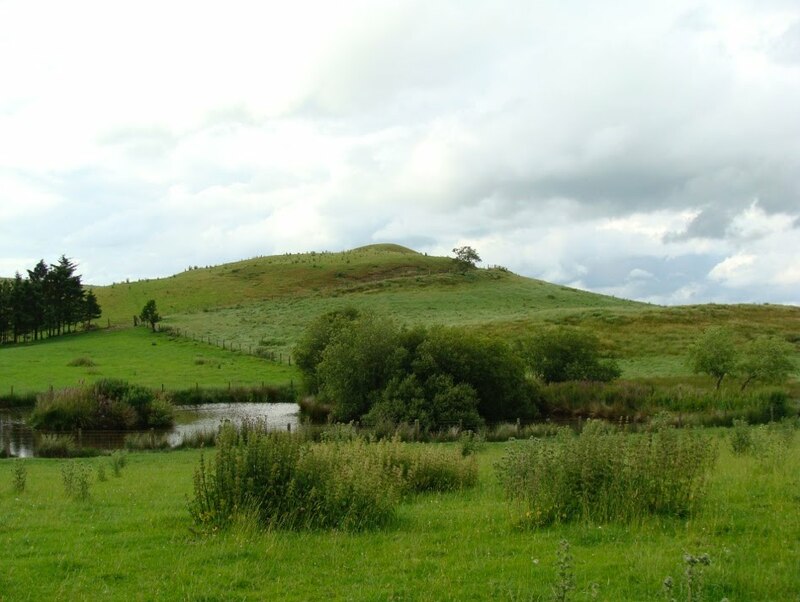 Tinboeth was one of the castles held by Cadwallon ap Madog, Prince of Maelienydd and later Elfael, and it is more than likely that it was his main residence. He had founded nearby Abbey Cwm Hir in 1176, and was closely associated with the local parish and church of Llanbister. 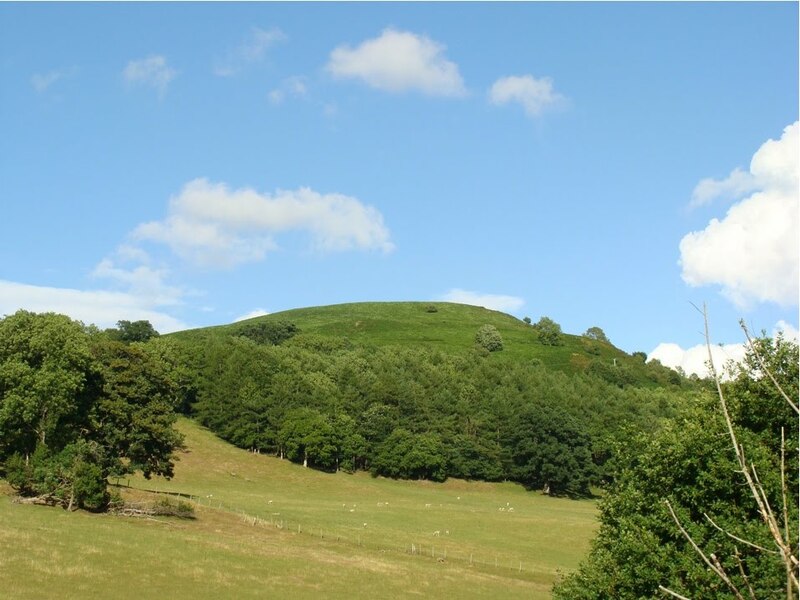 He clearly also held Dinieithon (Cefn Llys) and at some time also seized Cymaron Castle from the Mortimers, which was the site of an old pre-existing Welsh Llys. 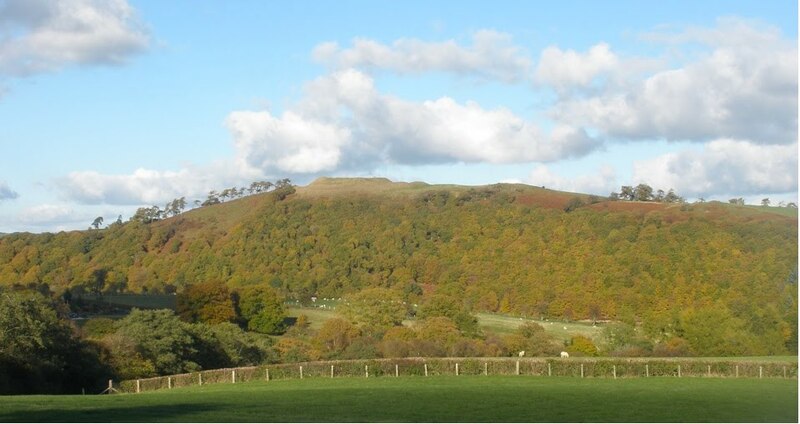 The name that features on modern maps today - Tinboeth - may seem to have lost its written linguistic clue to the place’s origin and use, but the local Radnorshire dialect would have spoken the word ‘Tinboeth’ as ‘Dinboeth’, enabling them to have preserved the linguistic connection to the history of this castle site. 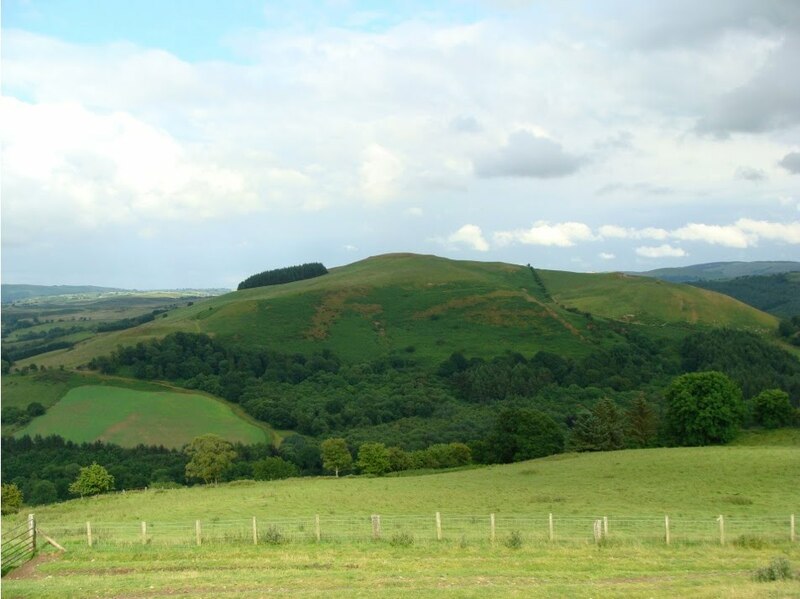 Another name it has been known as locally is Dinbod, rather like Llandrindod Wells is often referred to as Llandod! two hills Yr Allt and Ysgŵd (The Shoulder), which rises behind and to the right of the picture. Above: Looking east/northeast from the top of Tinboeth, from beside the tallest remaining piece of stonework from the castle. road to Llananno and Llanbister beyond is visible bottom right, with the River Ithon running alongside it. 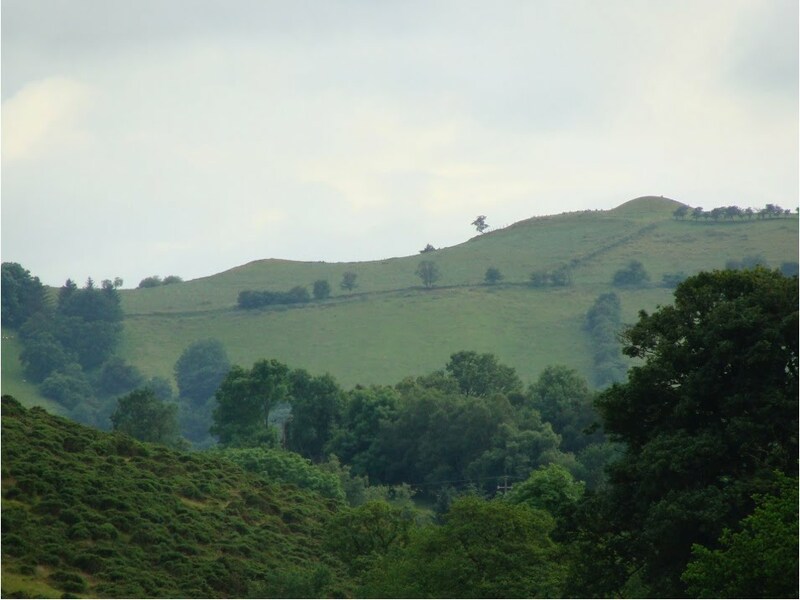 Marked as Tomen Bedd Ugre on maps, the long mound to the centre right of the picture is the so called ‘Giant’s Grave’. 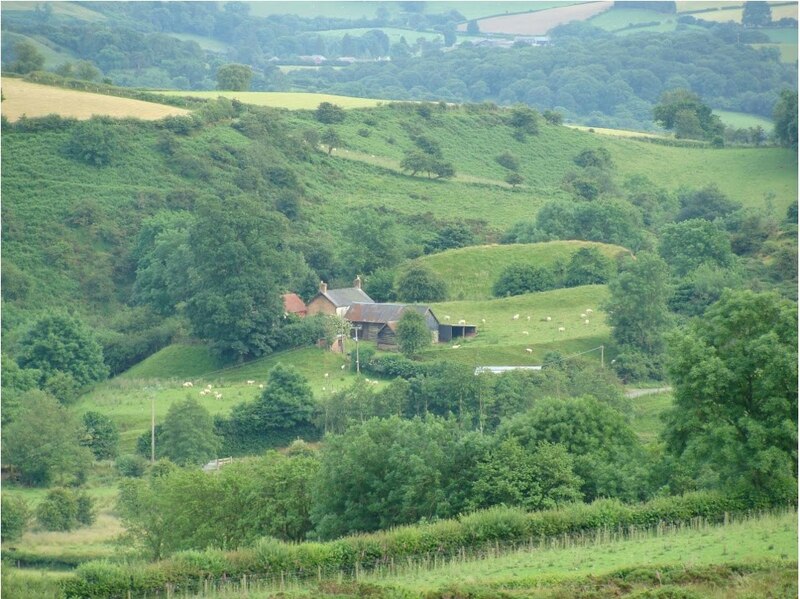 To the left beyond the picture, and below the hill, is the farm of Beddugre. J.E. Lloyd in his authoritative History of Wales from the Earliest times to the Edwardian Conquest provides some detail about Buddugre on page 255 of Volume 1, in a passage about the Cantref of Maelienydd as follows: The “swydd” or “shire” of Buddugre was the northern portion of the cantref, the particular Buddugre or “Hill of Victory” which formed the centre of this commote being on the banks of the Iethon. He adds further information in a page note relating to this: It is the “Bedd Ugre” of the maps. For the true form see Bruts, 409, Cymr. ix. 328; for the meaning and other instances, Evans, Dict. s.v. In welsh ‘Buddugwr’ means ‘victor’ and ‘Buddug’ means ‘victorious’. There is also a tradition of a big battle at Buddugre between the Normans and the family of Elystan Glodrydd in which the latter were victorious, so this may be how the site gained its name. 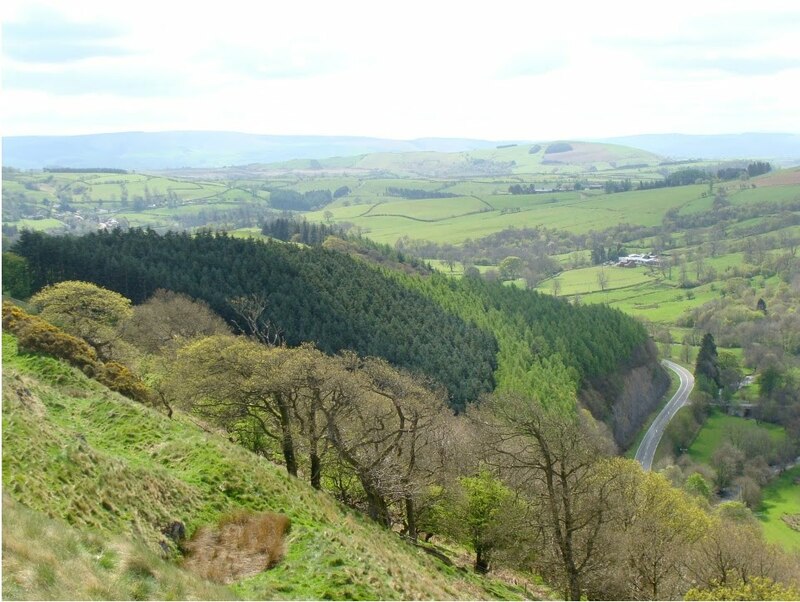 Below: view of Buddugre from the Llanbister road across the moorland of Moelienydd. This shows very clearly how high up it is above the Iethon River valley. magnificent and commanding position, with views all around. Some say that the castle takes its name from Cwm Aran (i.e. the valley of the River Aran), and Ordnance Survey maps support this origin for the name. However, there are other thoughts on this. Ffransis Payne in his book Crwydro Sir Faesyfed (‘Exploring Radnorshire’) pointed out that in a fourteenth century poem by Mab Cryg, in which the poet named all the rivers between the Wye and the Severn, he names the river as Cymaran. Lewis Glyn Cothi, in the mid fifteenth century also used the form Cymaran. 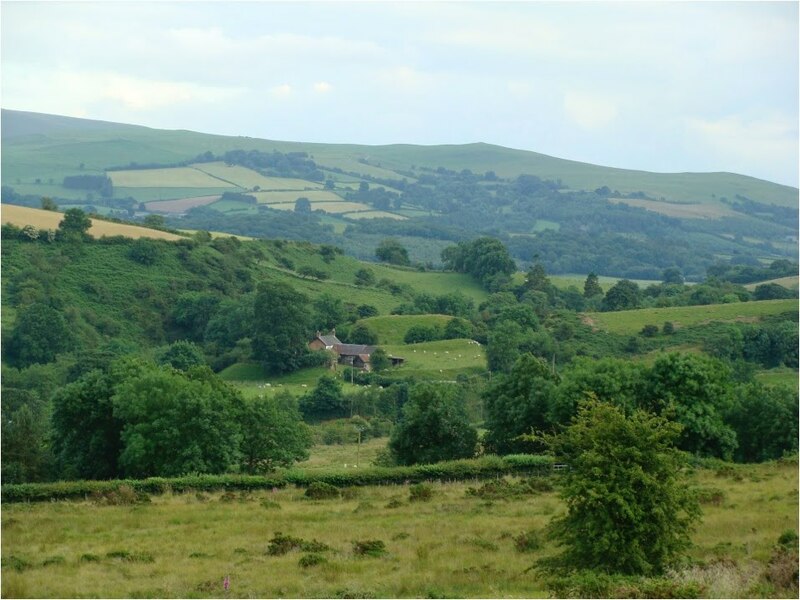 Jacob Youde William Lloyd, in his book The History of the princes, the lords marcher, and the ancient nobility of Powys Fadog, and the ancient lords of Arwystli, Cedewen and Meirionydd, records the name of the place as Cwm Aeron. There is another river - the River Aeron (Afon Aeron in Welsh) - in Ceredigion, that flows into Cardigan Bay at Aberaeron. In the upper reaches of the river one finds Glyn Aeron and Cwm Aeron. Perhaps the name of the river at Cymaron shares a similar etimology to the Aeron. In Anglesea there is a tidal creek called the Cymyran. 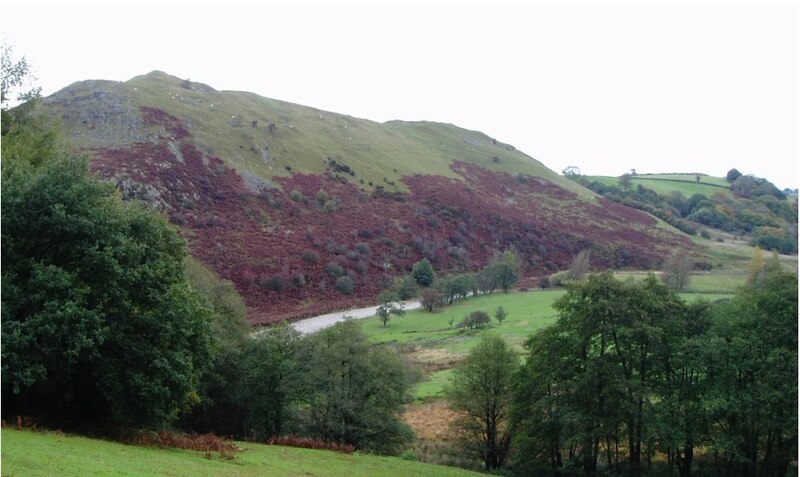 The Welsh word Cymyr means ‘confluence of rivers’ - this may be significant since Castell Cymaron lies at the confluence of the River Aran (name according to the Ordnance Survey maps), and a stream that runs along Cwmnantygelli. Below: Cymaron shown in its wider setting, illustrating the strangely ‘hidden’ nature of it site. Prince of Maelienydd. Cadwallon held it for many years. The castle was named after Pain FitzJohn, Sheriff of both Herefordshire and Shropshire, who is most likely to have built it. Remfry tells us that after Pain’s death the castle is likely to have been held by the Princes of Elfael, who had taken back control of Elfael-Is-Mynydd. It probably passed from Einion Clud and on his death to his brother Cadwallon ap Madog, Prince of Maelienydd who had added Elfael. It was later taken by the de Braose family with the lordship of Painscastle. Matilda (née: Maud de Valéry) refortified it. She was the wife of William de Braose 4th Lord of Bramber, whose possessions in Wales included Radnor, Hay, Abergavenny, Brecon and Painscastle. The Lord Rhys took exception to de Braose control in this region, whose Princes were his relations. 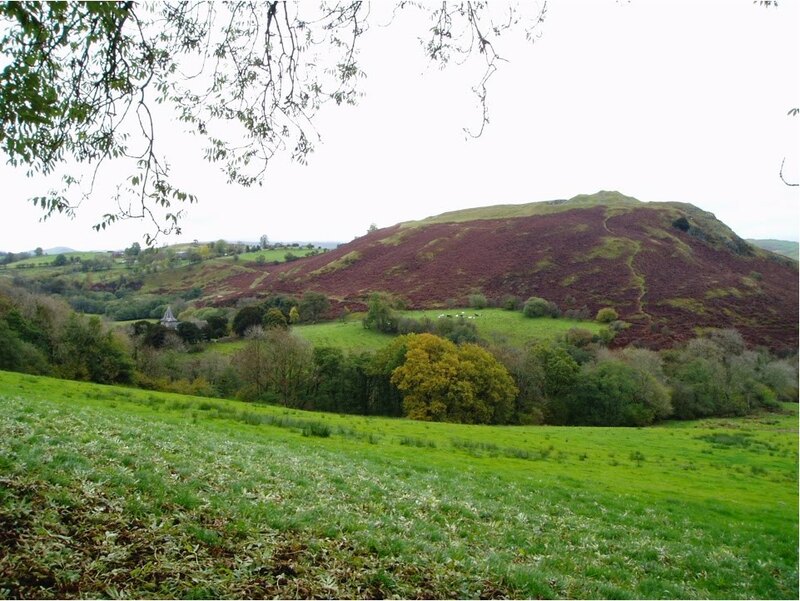 In 1196 he attached and defeated a marcher army at Radnor, taking back the castle there that had been held by Einion o’r Porth, and he also besieged Painscastle - although he took back the lordship of Painscastle into local Welsh control, he didn’t manage to take the castle itself. 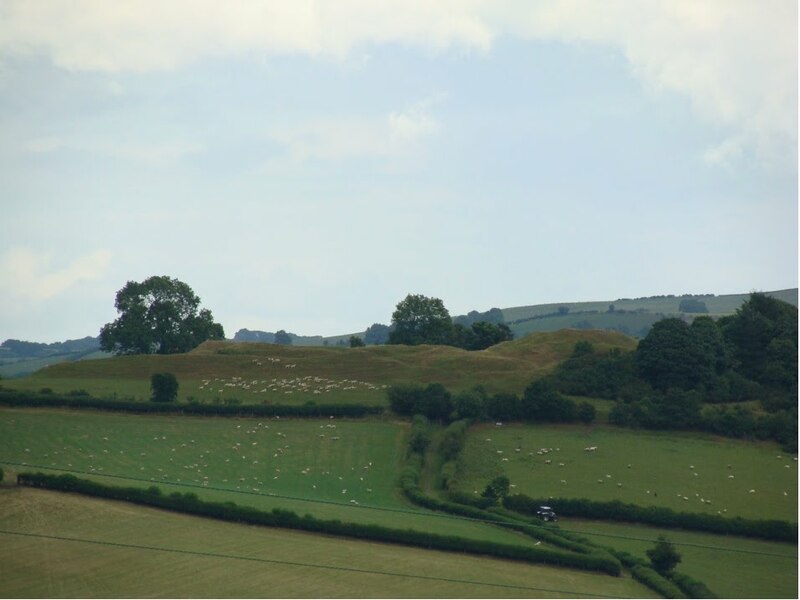 So, in July 1198 Prince Gwenwynwyn of Powys went to Painscastle with a very large army with the intention of finishing what The Lord Rhys had intended. However, he failed to use siege engines, so the garrison led by Matilda de Braose held out for three weeks giving time for King Richard I’s Chief Justicier, Geoffrey FitzPeter, to arrive with a relief army. In the ensuing battle, over 3,000 Welsh were killed. It was a complete disaster and amongst the many Welsh lords who fell were Anarawd ab Einion, the son and heir of Einion o’r Porth, Prince of Elfael. However, the balance changed when William de Braose fled Wales in 1208, having fallen out with King John. It seems that Iorwerth Clud, son of Einion Clud then held Painscastle. It then passed into the control of Iorwerth’s brother Gwallter Clud (or Fychan), in 1215; the two brothers had once disputed ownership of the castle. Roger Vaughan ap Gwallter succeeded his father and held Painscastle. 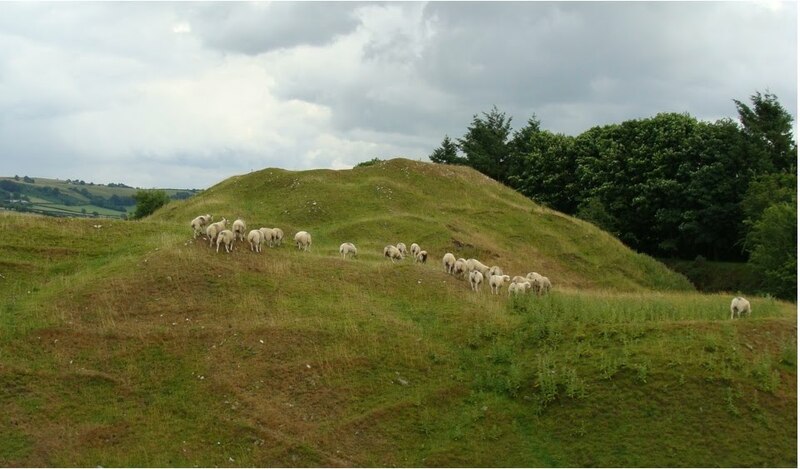 Below: the motte of Painscastle - with sheep as the only besiegers today. Twyn y Garth may well have been an old Hill Fort. 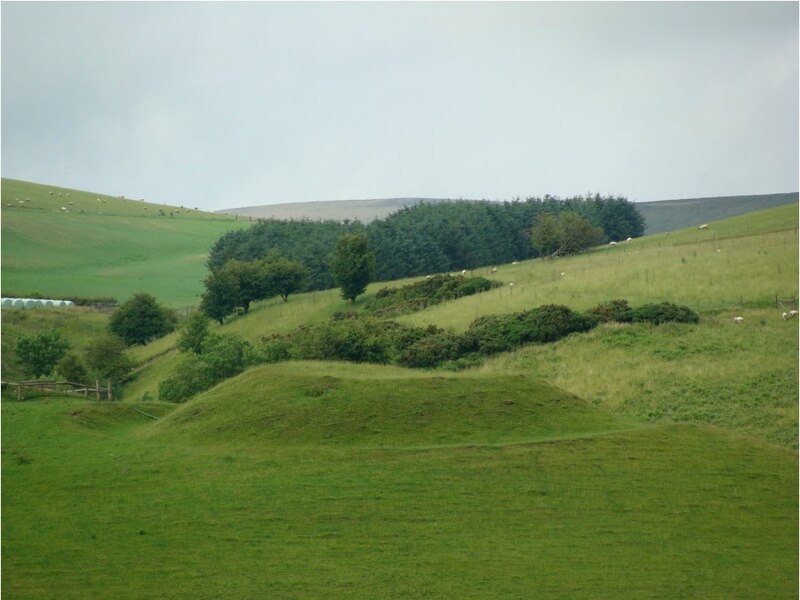 There are some old Barrows on the hill and the name itself tells us that there was an ancient ‘enclosure’ on the hill, perhaps a religious one. However, it is clear that a much later medieval castle was constructed on the site, even if never entirely completed as intended. 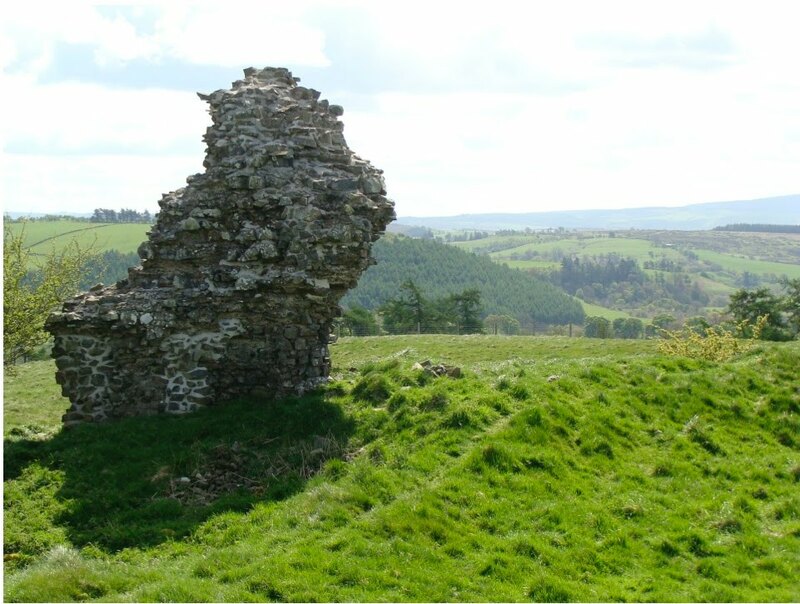 Remfry in his ‘Castles of Radnorshire’ suggests that it was most probably built by the local Welsh, perhaps Einion Clud, Prince of Elfael, and later held by his brother Cadwallon ap Madog, Prince of Maelienydd and (after his brother Einion’s death) of Elfael too. It is in a strategic location, sitting above the River Wye, on the opposite bank from Erwood almost at the junction of Elfael, Buellt, and Cantref Self in Brychieniog. 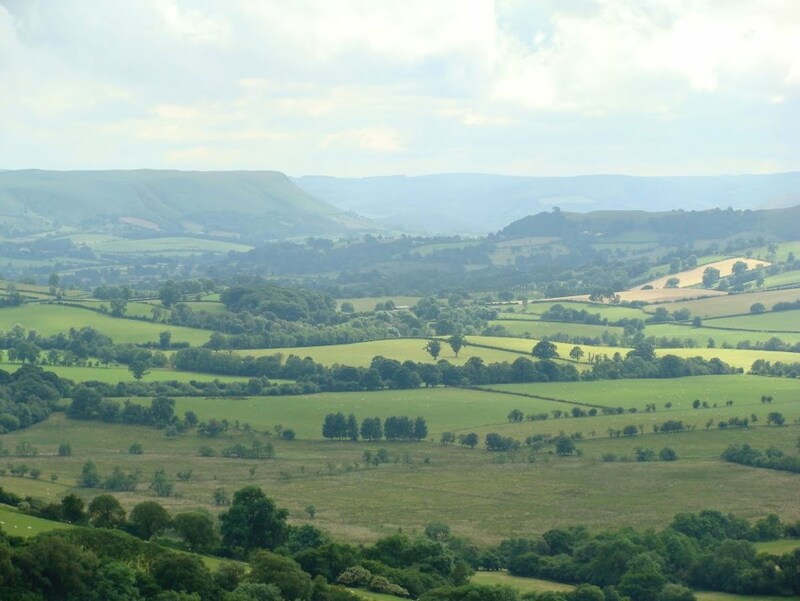 There are stunning far-reaching views all around, especially to the west and south west. Above: Twyn y Garth from the road south of Glanyrafon. The view is from the west. 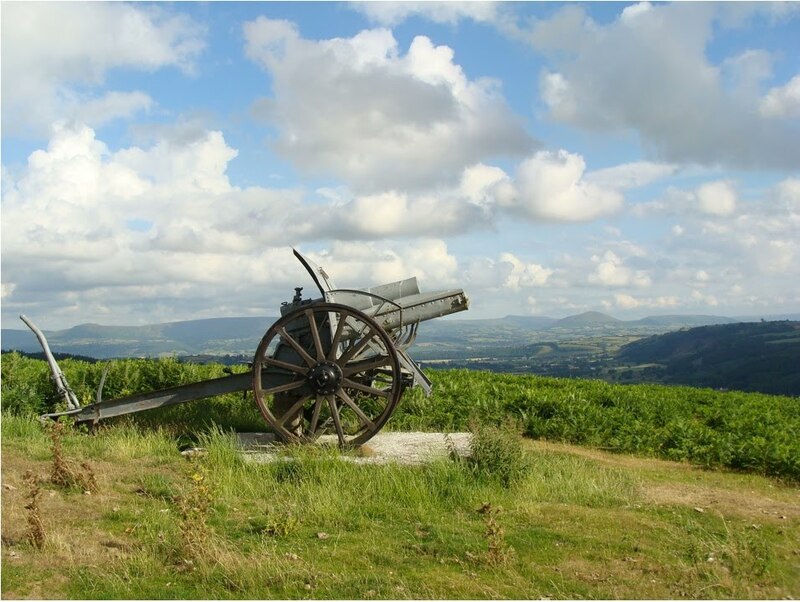 Below: the First World War German Field Gun mounted on the western edge of the fortress, pointing roughly west. filled-in trenches have created a bit of confusion for archaeologists. 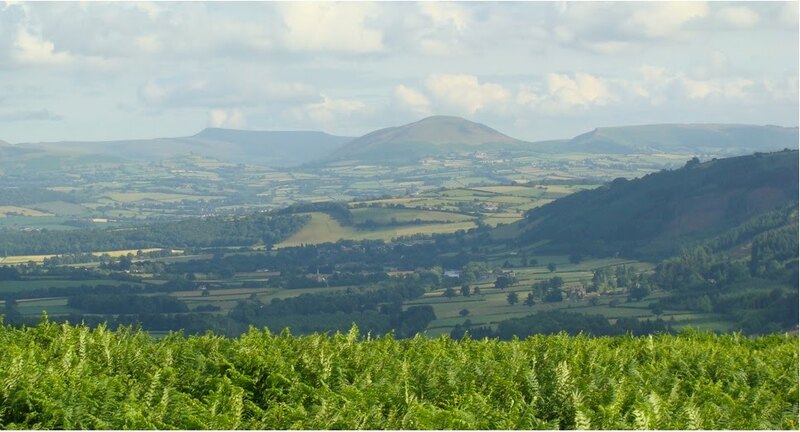 Troed, just below the substantial ridge-line of the Black Mountains beyond.